I’ve been a fan of playing games for quite some time and have introduced my boys to the joys of gameplay. I’m also a big fan of Wil Wheaton’s web series Tabletop where he and a few guests play various games from Munchkin to Qwirkle. I showed my boys part of the Qwirkle episode and they were hooked. Not on the series as much as the game itself. They don’t want to watch people play games, they want to play the games themselves! What could be better than this? What about making a game? A week ago, I happened to look down on the floor and noticed that the tiles were shaped the same as the tiles from Settlers of Catan. I’m not sure how my mind put it all together, but suddenly those simple floor tiles were sparking an imagination. I pulled out my smartphone, jotted down some ideas and did some research on making my own game. 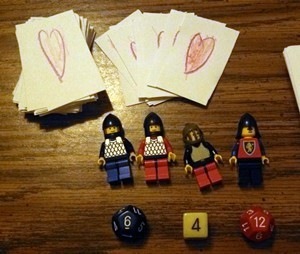 As I fleshed out the gameplay, I realized I’d need a board, cards (to represent armor, spells, weapons, etc), some kind of token to represent hearts, dice, and figures to move across the board. Luckily, I had many of these already. From a previous game effort. The hearts were from our previous game-creation effort. They were index cards which we cut into squares and which NHL drew hearts on. The dice were a purchase from our local comic book store (under $1 each) and the figures were Lego minifigs pulled from a large collection we have. To create the board, I first looked at purchasing hexagonal pieces, but then I got a better idea. I remembered a website that ThinkGeek had tweeted about a website that lets you print your own grid paper. This seemed like an essentially-free option to begin with. (We could always upgrade the game to use tiles.) As for the cards, we could use normal, blank index cards. At this point, I revealed my plan to my boys. They were both excited about it. JSL, in particular, has forbade me from doing any work on the game unless he’s involved. No, this game won’t appear in stores to purchase. (Though I might post the game once it is done.) The rules are sure to be extremely simple to the point that people who make actual games would scoff at them. And the the cards won’t have fancy artwork. In fact, the entire thing will scream "homemade." Still, this will be awesome because I’ll be making this with my boys.